Have You Chosen the Right Cable Jackets? Have you noticed that patch cables are all wrapped in various jackets? These cable jackets are important to serve as the protection for inner cable parts. Different kinds of jackets can influence the applications as well. Knowing the differences in cable jackets will help you make better decisions when choosing cables. Lots of materials can be made as cable jackets to cope with different situations. This article will mainly introduce some common types and analyze their distinctions. PVC (polyvinyl chloride) is a common jacket type widely used for general patch cables. The low cost and easy manufacture contribute to its popularity around the world. You can find PVC jackets almost everywhere when patch cables are used. PVC material is highly moisture-resistant so that can be perfectly applied to humid environment. But it also has some defects that will limit the service lifespan. For example, PVC material often becomes fragile under direct sunlight and its flexibility is restricted when greater bending is required. LSZH (low smoke zero halogen) is the material that gives off low toxic and corrosive gas under fire. It greatly ensures the high visibility and low respiratory damage when cables come across open fire or short circuit fault. LSZH cable jacket is typically applied to areas where smoke factor is considered to be the most important, such as aircraft, rail cars, ships, buildings and so on. OFNP (optical fiber nonconductive plenum) is specified by NFPA (National Fire Protection Association), which has no electrically conductive component inside optical cables. This type of cable jacket can effectively prevent fire and emit low smoke. OFNP cable is the highest fire rating fiber cable and has no replacement. 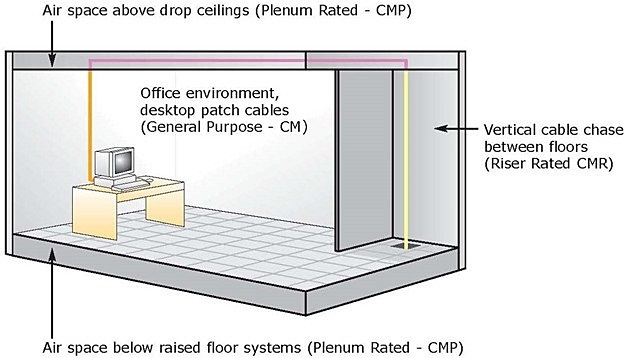 Places including ducts, plenums, and other building airflow areas are suitable for installation. PUR (polyurethane) cable jacket is the thermoplastic material that is usually used in harsh environment. It provides both mechanical resistance and chemical resistance. Thus, PUR cable can be installed for industrial applications where strong protective coating is demanded. Also, its flexibility makes itself a good material for retractile patch cables in continuously flexing applications. But it is more expensive than the common cable jackets. PTFE (polytetrafluoroethylene) sheath is a synthetic fluoropolymer material suitable for extreme environment. It is very durable under both high and low temperatures and can not be affected by most oils, fuels and fluids. This kind of cable jacket is widely used in military, aerospace, coaxial, and appliance wiring applications. Rubber jacket is a good option for portable power applications in outdoor or wet environment. It has better performance than plastic materials in flexibility, high temperature resistance and durability. Other applications like mining submersible pumps, control circuits, motor and associated machinery, construction equipment, etc. are also available. Silicone is the synthetic rubber with greater flexibility and stronger resistance against extreme temperatures and chemicals. Of course, it does not operate as high temperatures as PTFE. But with the extremely supple characteristic, silicone cable sheath is perfect for applications where lots of wire bending are required. And when it encounters fire, only a small amount of smoke will be produced which is also environmental-friendly. After reading this article, you may get a general idea about the current cable jacket types and where they should be used. And certainly, if you want to find the most suitable jacket for your project, knowing this information is not far enough. But I hope this article can let you understand the importance of choosing a right cable jacket in your future applications. The increasing demand of LSZH cables has been driven by published concerns for safety of humans and electronic circuits during fire, the protection of the ozone layer, non-toxic elements to water table and landfills when discarded, and an increase in requirements/specifications by the European and the International communities. LSZH cables mean the insulation and jacket compound are free of halogenated materials like Fluorine(F), Chlorine (Cl), Bromine (Br), Iodine (I) and Astatine (At), which are reported to be capable of being transformed into toxic and corrosive matter during combustion or decompositions in landfills. During combustion, Low Smoke Halogen Free Cable produce low levels of halogen gases, which have a minimal effect on the human respiratory system when inhaled, as well as a low level of Hydrogen Chloride (HCl), which is non-damaging to electronic circuits or machinery. Also, a low level of white smoke is generated, improving visibility by increasing the chances of people to visually find their way out to safety during fire. Low Smoke Fume, or LSF, is another term used by certain manufacturers for LSZH cables, but there are no standards for LSF. This means manufacturers can label their products LSF as long as they give off reduced (HCl) emissions. LSF cable is, in fact, just reduced HCl emissions, giving off <15% (HCl). FiberStore product line has been developed to address the industry’s need for LSZH cable products that are UL listed, flexible, flame retardant and resistant to oil and sunlight. Our LSZH cables may be used and installed in places where safety, performance and concern for the environment are important. PVC and LSZJ are very different. PVC patchcords are very soft. LSZH patchcords are more rigid because they contain the flame retardant compound, and they are aesthetically more pleasing. A PVC (polyviny chloride) cable has a jacket that gives off heavy black smoke, hydrochloric acid, and other toxic gases when it burns. Cost: LSZH components are slightly higher in cost than some PVC compounds, but it is the safety factors as they related to humans and electronic equipment as well as friendliness to the environment that should be considered when it comes to cost. Flexibility: There is a limited range of compound flexibility available for LSZH compounds versus PVC so it not recommended for robotic or continuous flex applications. Flame Retardant: There is a higher grade of flame-retardant PVC compounds available on the market like Plenum PVC because of the halogen additive in PVC like Chlorine and Bromine that are not allowed in LSZH compounds. When selecting or designing a cable for any application, the operating environments where the cable will be used, whether extreme or not, must be considered along with availability, performance, and price, among other things. When the safety of humans and the environment is a consideration, along with high-performance and capability, then FiberStore LSZH cables are what you must specify! Halogen is a nonmetallic elements such as fluorine, chlorine, iodine or bromine. It is generally used as flame inhibitors in many plastics, including PVC that goes into cable insulation and electronic products. Halogens are a group of chemical elements including iodine, bromine, fluorine, astatine, and chlorine. When these elements are exposed to fire, they form hazardous gases which are harmful to harm the eyes, nose, lungs, and throat. LSZH is a material category used to classify cable insulation. LSZH (Low Smoke Zero Halogen) cable insulation is made of materials designed to give of reduced smoke and no halogen when exposed to fire. When combined with other fire deterrents and control practices, Zero Halogen Cables can help reduce fire related casualties and property destruction. These cables will also don’t give off hazardous gas/acids or toxic smoke when exposed to fire. LSZH cables decrease the extent of smoke produced through fire and is normally used in inadequately ventilated areas, for instance, airplane and some areas that people may be affected by smoke and toxic fumes. Beside the halogen free features, LSZH cable also has lighter weight, this is convenient especially if the cables are run overhead in a dropped ceiling. At the same time, the impact of halogen free cables will also be lower if there is a fire because there are fewer toxic chemicals involved. Many different Fiber Optic Cable suppliers are now making low-smoke, zero-halogen cables. And it is currently widely used in Europe and elsewhere in the world contains halogens. The European market is demanding that cables used in LANs. WANs, etc. Meet LSZH specification. The IEC 60332-1 governs the Flame Retardant Grade specifications in reference to LSZH cable. Essentially the compound used in manufacturing cables meeting the above specifications reduces the amount of dangerous/poisonous gases in case of fire. The main difference in specifications between IEC 60332-1 versus UL 5181, UL 1666 and UL 910 is that the cable under the IEC specifications continue to burn while still emitting very low gases. UL specs demand that the flame be extinguished, but it can still be emit poisonous/dangerous gases. Most safety advocates are calling for the used of LSZH cables, especially for the plenum space. Review your local building codes to determine if you must use LSZH cable. Non-LSZH cables will produce corrosive acids if they are exposed to water when burned; such acids may theoretically further endanger equipment. 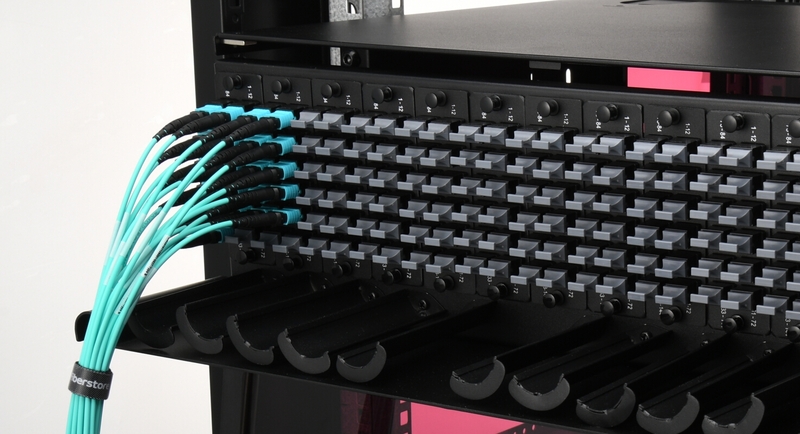 If you have concerns on why do we have to run LSZH cables in some special networking cabling environment, FiberStore editor here is pleased to make it all a little clearer. In this article, we’ll explain a little abut what halogens are, what’s the difference between PVC and LSZH cable, and why do we have to run the LSZH cables. A halogen is a nonmetallic element, such as fluorine, chlorine, iodine, or bromine. When exposed to flames, substances made with halogens give off toxic fumes that quickly harm the eyes, nose, lungs, and throat. Did you notice tsat fluorine and chlorine are commonly found in cable insulation and jackets? Even when cables are designed to be flame-resistant, any cable when exposed to high enough temperatures will melt and burn. PVC cables contain chlorine, which emits toxic fumes when burned. What’s the difference between PVC and LSZH cable? We know, much of the cable currently in use in the United States and elsewhere in the world contains halogens. The European market is demanding that cables used in LANs, WANs, etc. Meet LSZH specification. The IEC 60332-1 governs the Flame Retardant Grade specifications in reference to LSZH cable. Essentially the compound used in manufacturing cables meeting the above specifications reduces the amount of dangerous/poisonous gases in case of fire. The main difference in specifications between IEC 60332-1 versus UL 5181, UL 1666 and UL 910 is that the cable under the IEC specifications continue to burn while still emitting very low gases. The UL specs demand that the flame be extinguished, but it can still be emit poisonous/dangerous gases. A PVC cable is made of polyvinyl chloride. It has a jacked that gives off heavy smoke, hydrochloric acid, and other toxic gases when it burns. Low smoke zero halogen cable has a flame-resistant jacket that doesn’t emit toxic fumes even if it burns. PVC patch cords are soft, while LSZH patch cords are more rigid because they contain the flame retardant compound, and they are aesthetically more pleasing. Many different fibre optic cable manufacturers are now making low-smoke, zero-halogen (LSZH or LS0H) cables. These cables are designed to emit no toxic fumes and produce little or no smoke when exposed to flames. Tunnels, enclosed rooms, aircraft, and other minimum-ventilation areas are prime spots for the use of LSZH cables because those areas are more difficult to escape from quickly. Why do we have to run the LSZH cable? LSZH cables are popular outside the United States. Some safety advocates are calling for the use of LSZH cables in the United States, specifically for the plenum space. Review your local building codes to determine if you must use LSZH cable. Non-LSZH cables will produce corrosive acids if they are exposed to water (such as from a sprinkler system) when burned; such acids may theoretically further endanger equipment. But many opponents of LSZH cable reason that if an area of the building is on fire, the equipment will be damaged by flames before it is damaged by corrosives from a burning cable. The flame-spread properties are worse than for cables in use today. Numerous studies by Bell Labs showed that cables composed of LSZH will not pass the plenum test, not because of smoke generation but because of flame spread. Most Low Smoke cables designs will only pass the riser test where the allowable flame spread is greater. Second, consider practicality. LSZH is an expensive solution to a problem that doesn’t seem to really exist in the United States.